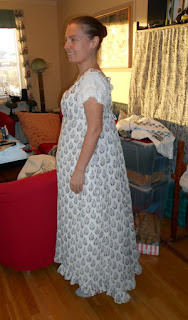 Allt it really needs now is sleeves. 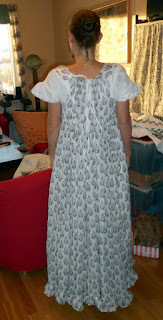 I am thinking about making short puff sleeves and separate long sleeves that can be attached to the short sleeves. There's one exampe of that in Patterns of fashion, and many more in images of the period. Photos. With cat in box. The ties in the back will be tucked in, and tied a little looser at the neck too. This is my first regency dress without a lining in the bodice, but the originals that I looked at for the pattern were all unlined.